The Create-A-Thon fundraiser is a blast! Great food, fun, and fellowship! And, LOTS OF DOOR PRIZES!! 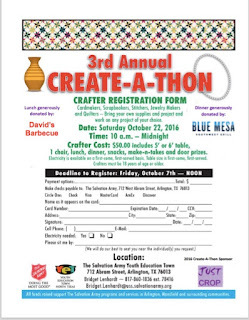 Contact Bridget.lenhardt@uss.salvationarmy.org 817-860-1836 with any questions or sign up.